Water and sanitation for everyone! So when a little article in the local newspaper caught my eye I decided to chip in for my little bit. A pub in Brighton – the Prince Albert in Trafalger Street – instead of charging customers for tap water or tea, asks them for a voluntary donation to Water Aid. A great idea, but since I don’t drink any of these – well not when I’m in a pub – I think it’s a nice idea to simply donate a small amount directly. Everybody in this world should have access to clean, safe, drinking water, so every organisation that aim to achieve that deserves support, I think. 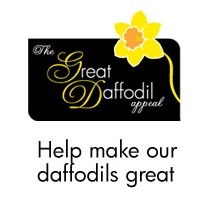 So continuing on from my earlier charity of the day, the Great Daffodil Appeal now features as Charity of the Month – the second for February. I’m feeling generous :p.
The personal reasons I cited before for this charity being important to me are as follows (briefly): my mom died of cancer in 2005, and in her last few months she received great palliative care and spent as good a time as possible in a hospice. So I have seen how important that type of work is – it can’t all be of the ‘Great Important Curing Cancer Forever’ type, however necessary that work (too) is. The people, nurses, who do that work, are dedicated, experienced, patient, and cannot be praised enough. And even though my mom of course received the Dutch equivalent of this care, I now happen to be here in the U.K. – so I’m donating to the British charity who supports it. I should also mention here that my dad (for reasons that need no further explaining) is doubling my contribution. Good stuff. I know it’s not a very fancy or high-profile charity, but they are worthy! Of course! In the month of Darwin’s bicentenary, what better charity to give to than ‘his very own’ foundation? I don’t need to explain – but will anyway – that not only were the Galapagos Islands extremely important to Darwin’s development of the theory of evolution, they are also a stunning piece of nature with loads of unique species. For a long, but interesting read, check out their strategic plan for the next years: Darwin Foundation strategic plan (it’s a PDF). So without further ado, why not join me and donate to this great cause? Just a small one, but one that is important to me for personal reasons: the Marie Curie Great Daffodil Appeal. Providing nursing care for (amongst others) terminal cancer patients. A very good job indeed. Today I just ‘bought the daffodil’ but I will donate more later (maybe as a bonus ‘charity of the month’). Buy your daffodil too! Or donate, even better. It is better to give than to receive. I truly believe it – that’s why I always tell my friends this :p.
The first charity is one I personally am quite fond of: Sight Savers. Most of what I can write about them, you can also read for yourselves on their website, so please do. (I did find that parts of the website are not particularly up-to-date – let’s just be generous and say they spend more time helping people than maintaining their web site!). Given that blindness takes somebody virtually completely out of the social and economic life for good, I find it very impressive to be able to prevent this for only 5p. So, once a year, after I have donated my 5p, I … JUST KIDDING!! Another reason to support them is that they operate on grass-roots level, working directly with villagers – many of whom are volunteering to do the needed tasks. As far as I know, they do not hand their money over to potentially corrupt politicians. This may qualify as neo-colonialism, but it works well. A final reason is that the support they provide is strongly aimed at being structural, long-term. They teach people what to do to prevent disease wherever possible (instead of just handing out medication post factum), train local teachers so that they can educate blind youngsters ‘forever after’, train local doctors who can then use this knowledge, and pass it on… all very much aimed at building. Enough of that, now I’m off to donate. Why not join me? I’ve decided not to say how much I’m donating. On the one hand I think it may come across as truly vain – or leading to the reaction ‘what, THAT LITTLE? !’; on the other hand if I keep mum people may get the impression that I’m giving very little or giving shitloads – which I’m not :p. Either way I could lie about it anyway. So ‘ll just not publish it – it is irrelevant, really. The plugging is what matters.